Kayak tours in Tofino let you go where many visitors can not. Paddling through narrow channels between myriad islets in Tofino's Clayoquot Sound, you can observe abundant varieties of wildlife at eye level. Kayaking adventures let you leave the crowds behind and come much closer to the beauty of nature on Canada’s fabulous Pacific Rim National Park Reserve, also near Tofino. Tofino sea kayaking businesses provide experienced guides who will instruct and coach you on safety and the basic techniques of kayaking. Most Tofino kayaking companies pair a maximum of six paddlers with a guide. Beginners can pair up and combine their paddling muscles in a stable double kayak. Or, one person can paddle while the other snaps photos or drags a fishing line. You will see much more wildlife when the only sound you make is your paddle dipping into the water. Moving quietly allows you to get closer to marine birds and mammals and fully enjoy the welcome peace and quiet of the Pacific Rim and Clayoquot Sound nature environments. There's no need to go fast! The slower you go, the easier it is to get right beside a raft of otters, a colony of sea lions, or beachcombing bears and observe their activities from the best seat in the house aboard your kayak. 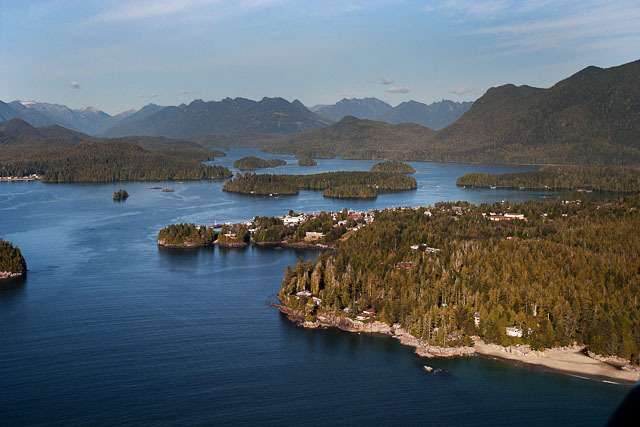 There are so many amazing adventures to be had along B.C.’s west coast, near Tofino!